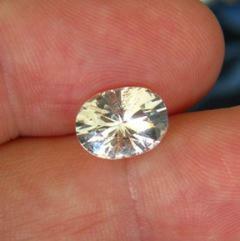 Comment: "Brand-new" diamond-scaring gemstone variety from Burma (originally discovered in the USA). Here with the faintest yellow (see side-images). Fine brilliant cut. Shining in the dark. Fully durable for jewelry. High refractive index gives good sparkle. A low specific gravity makes 2 ½ carat quite big a gemstone already. Better than images.